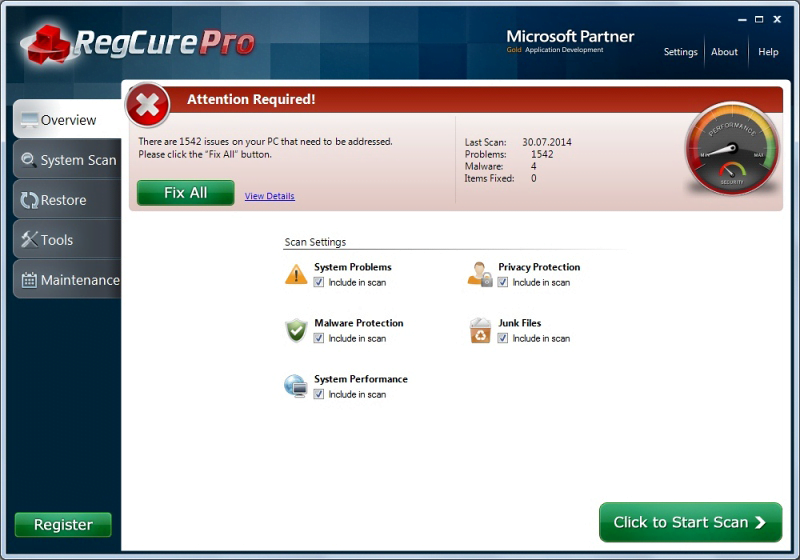 RegCure Pro is a dependable remedy for sluggish system performance and privacy issues. 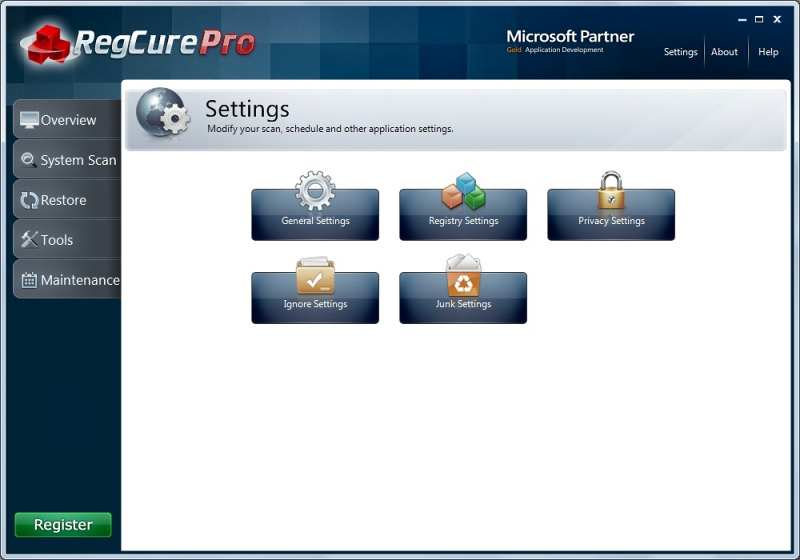 RegCure Pro is a popular computer optimization utility primarily intended for everyday OS maintenance and accommodating some extra features such as a restricted extent of malware protection as well as user privacy defense. In particular, this product by ParetoLogic is tailored to address system errors, including ActiveX related problems; malicious processes powering viral activity; performance issues leading to system freeze-ups and crashes; files having a private data disclosure potential; and junk objects cramming up the disk space. RegCure Pro’s not-too-lengthy customizable scan identifies problems associated with all of the above PC functioning areas and provides a one-click fix for the registered users. The present review is meant to scrupulously evaluate how effective and user-friendly this solution is in accomplishing the above tasks. Fast-forwarding it a little bit, the program does a good job within its competence but isn’t absolutely immaculate in regards to a few nuances, one of which is the slightly exaggerated alerting on some non-critical bugs, the other having to do with hurdles we encountered when testing the File Manager feature. Overall, though, the application is highly competitive in the niche of system optimizers and registry cleaners. Be sure to read the rest of this article to learn the details as per the study conducted. 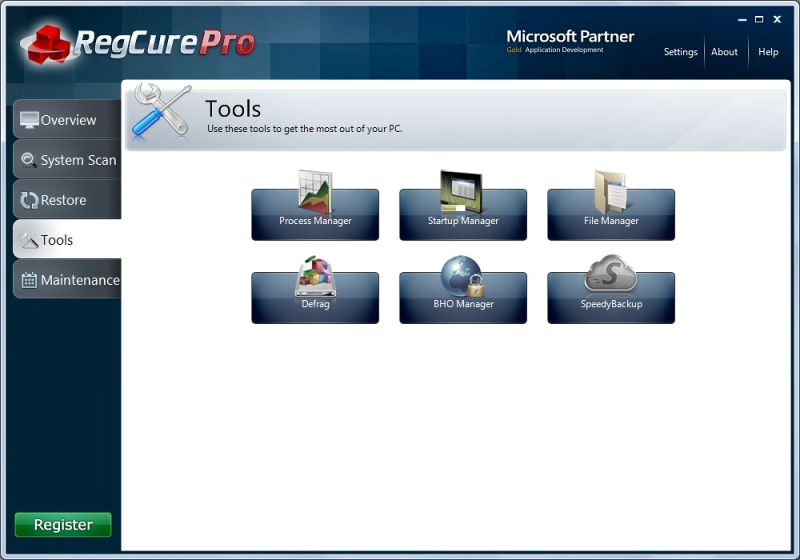 When it comes to installing RegCure Pro, an approximately one-minute wait, several clicks – and you’re done. The installer named RegCureProSetup.exe is a 6.4 MB file which, when executed, ensures a smooth procedure with little user involvement. The phases to go through are: accepting the License Agreement, selecting the type of install and the target folder, or simply opting in to the program’s recommendations. The disk space required for the application modules is 16.7 MB. Supporting all of the earlier OS versions, the latest build is also Windows 8 compatible, which is definitely on the plus side of the software. The installation is immediately followed by a system scan that gets triggered automatically in order to perform an initial PC check for system problems, sensitive privacy items, junk files, malicious objects, and performance issues. By the way, the scan options are easily customizable through the Overview menu where you can include and exclude the items to check for. Utilities of this sort tend to take a fairly long time to conduct the first scan of a yet unfamiliar system, but RegCure Pro did the job within 10 minutes, reporting loads of things that may cause trouble. That’s pretty commendable in terms of the respective benchmarking. The overwhelming majority of the detected issues are junk files, the number thereof reaching a hard-to-believe 1445. Generally, four out of five areas that got monitored had an alarming damage level of serious to critical, which was surprising considering that it’s a smoothly performing system which is, moreover, protected by a reliable antispyware suite. Anyway, an additional fix never hurts, but RegCure Pro’s risk scaling might be a little less spooky and not so eye-catching. That’s a humble opinion of ours though. The application’s graphical user interface is intuitive and the features presented within the dashboard are self-explanatory. The main functional load is concentrated in the left-hand navigation section, whereas the settings, the product information and the link to the help materials are a little less conspicuously lined up in the top right-hand part of the GUI. What we found kind of nagging is the System Scan button which, once clicked, triggers a new scan each time without the user being asked. Another thing that some might not admire is the voice notifications which are active by default, but those are not a problem to deactivate through the General Settings. RegCure Pro does not call forth overly high CPU usage during system scans and error fixing; at least none of these processes slow the computer down. Again, the interface is easy to understand and navigate, and toggling the user preferences as well as other settings appears to be simple. 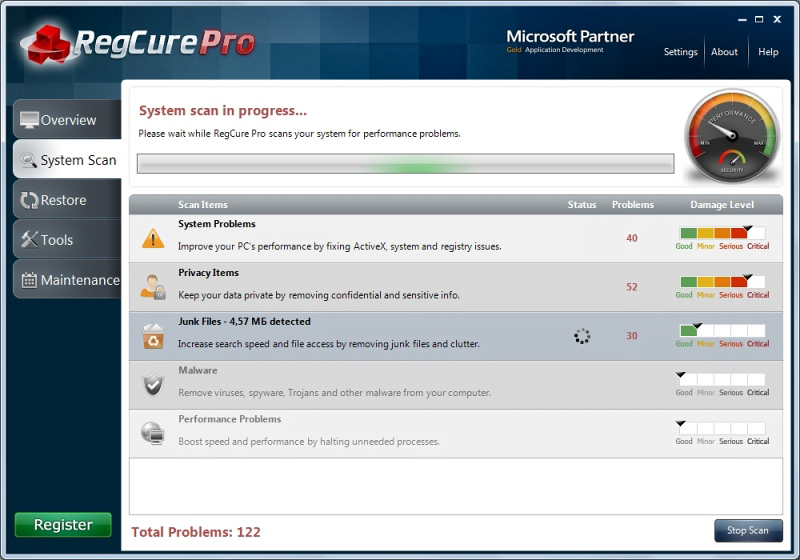 System errors fixing is the feature that makes RegCure Pro a primarily computer optimization solution. It’s namely this built-in capacity that allows the utility to analyze and correct Windows registry issues which cause discrepancies in the associations between hardware, software and users. The program also handles errors for ActiveX, file path references, shared DLLs, application paths, shell extensions, etc. The ability to spot and terminate malware processes is not quite the main focus of the utility being reviewed, but it actually is fit to deliver some degree of virus protection. 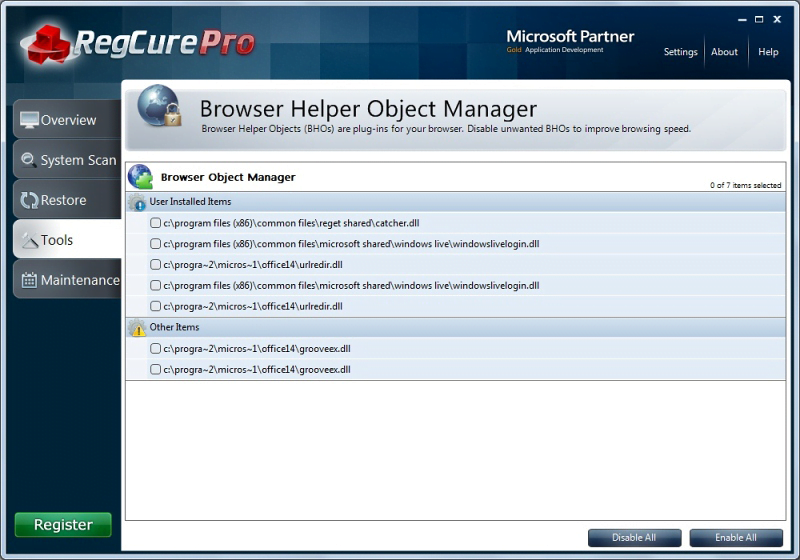 RegCure Pro identifies active processes that are associated with known viruses, Trojans, spyware, potentially unwanted browser helper objects (the BHO Manager feature), and ceases those for good. Performance optimization is fulfilled by finding and disabling unnecessary resource-heavy processes that slow the system down and thus lead to longer application response times hence user experience deterioration. A significant part of this functionality is related to startup objects analysis (the Startup Manager feature), where you can view the entire list of programs launched at the beginning of every Windows session and disable any redundant items. Furthermore, junk files that clog up computer memory and prevent normal apps from running smooth are also accurately spotted and deleted. RegCure Pro protects your privacy by singling out and irreversibly erasing all files that might get you compromised if third parties get hold of them. This mostly applies to the information generated during web surfing, such as tracking cookies, some fragments of the Internet cache and the like. Traces of online activity may well disclose one’s credit card data, logins, passwords, etc. Cleaning up all of the information that may cause privacy violation is within this application’s competence, being a matter of a few clicks only. Defrag is one of the features within RegCure Pro’s system optimization competence, but it’s certainly worth a special mention. The idea behind it is basically the same as for the native Windows defragmentation functionality, but the analysis accuracy and the thoroughness of the end process itself are fantastic and definitely of higher quality. When bits and pieces of data are grouped together the right way, the OS gets a boost you won’t fail to notice. The File Manager feature presents a way of looking up and downloading the programs tailored for opening certain file types. What you need to do is go to Tools –> File Manager, type a file extension of interest (.doc, .docx, .pdf, .jpg, etc.) and click the Find Software button. RegCure Pro then comes up with a complete list of recommended solutions. Sounds great, but the way this feature works in practice shall be described in the next section of this review. Restore Point Manager makes the system restore procedure a much more user-friendly process than the respective Windows feature. Also, this option allows you to free up disk space by eliminating the old restore points that you no longer need. 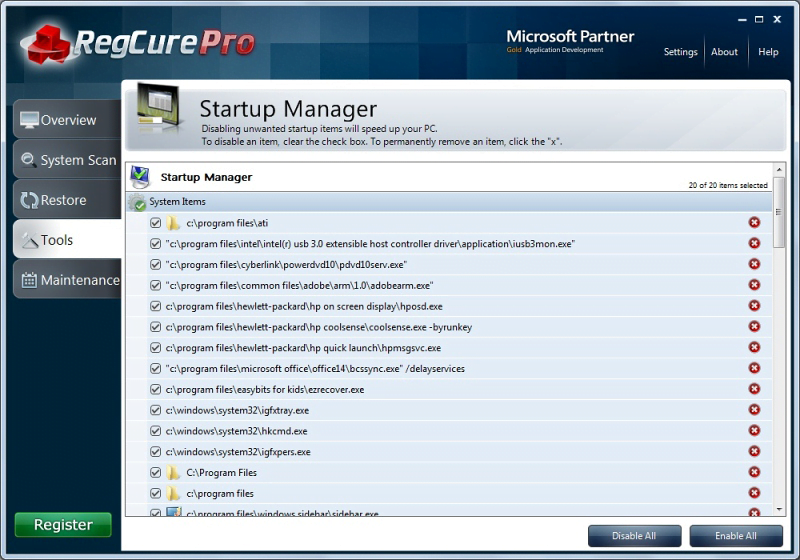 The menu item called Maintenance is intended to make it easy to schedule different tasks that RegCure Pro performs: defrag scan, malware cleanup, system problems fixing, privacy scan, and junk files cleanup. Simply pick the times when these processes should be triggered out of the options available, that is, daily, twice a week, once a week, and monthly. SpeedyBackup allows, upon creating a free account, backing up the computer files to the cloud. This feature could be of great help if important objects are deleted beyond recovery or in case the PC undergoes a severe crash; in either of these scenarios all documents, media files, images and other personal things can be restored. Disruptive registry errors, junk files accumulating over time, known malware-related processes, potentially privacy-disclosing items – all of these are quickly and effectively taken care of as long as RegCure Pro is the optimization tool of your choice. Extra features such as Defrag, Restore Point Manager and Startup Manager also certainly contribute to the system’s overall health, speeding it up, prioritizing important processes and freeing disk space. All issues that get detected during the system scan are irreproachably repaired, no problem there. We encountered a hurdle using the File Manager feature though. It works great searching for the appropriate software to open a certain file extension, but every single time the Learn More or Download buttons are clicked for the returned applications – a browser error message would pop up, reading: “Cannot Access Information. Product information is not available at this time. Other quality products are available to open the file extension(s) that interest you. We recommend that you try another software product.” The same failure occurs for all file types we entered, be it .jpeg, .png, .exe, .pdf, .doc, .txt, etc., and for all the programs provided. Apparently, this feature is non-functional at this time, so the vendor should either consider fixing the bug or excluding this option from the program’s tools. Generally, though, RegCure Pro copes with the system optimization task without troubles or nuances whatsoever. A fairly extensive product knowledge base is accessible directly from the main pane – all it takes is clicking the Help button in its top section. This online resource explains how to get started with RegCure Pro, how to use its features and toggle the settings provided. Extra options for users include Q&A lookup, email submitting (responded within 24 hours), and toll-free phone support for U.S. customers. Therefore, should a need for program troubleshooting occur, users have a pretty standard range of help options at their disposal, which should suffice for resolving the common problems if encountered. RegCure Pro is a dependable remedy for sluggish system performance and privacy issues due to its indisputable ability to fix Windows registry problems, sweep away junk files, carry out extensive defragmentation, and eliminate sensitive objects. The other tools built into this utility, such as the malware protection module, file extension and BHO managers are handy, yet probably not as essential. Security-wise, one cannot entirely rely on this program for combatting viruses in real time; applications designed especially for these purposes should be used instead if that’s the goal. 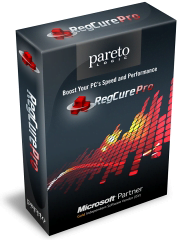 All in all, ParetoLogic RegCure Pro saves you the entire hassle of PC optimization.